Vivian Melde works for Ecology and Environment, Inc., as an environmental consultant, specializing in public involvement, planning, and emergency management. She is a member of the Superfund Technical Assistance and Response Team (START) as a contractor for the US Environmental Protection Agency. START assists the EPA in emergency responses to oil and hazardous materials incidents. As a life-long dance and theater performer, Vivian has been a featured artist at Cyrano’s Off Center Playhouse in Anchorage since its doors opened with Thy Country’s Good, in which she played Black Caesar. In February 2015, she directed Eve Ensler’s Emotional Creature, which brought together a mulch-ethnic cast of seven talented women between the ages of 18 and 32. 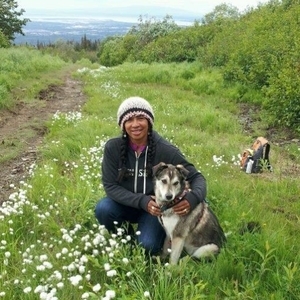 In April 2015, she was one of the creators of We Came to Stay: Anchorage Untold Stories, a project celebrating the lives of immigrants who arrived in Anchorage during her centennial years, www.anchorageuntoldstories.com. In 2013 she played Maryamma, an Indian spirit guide from the netherworld, in Miss Witherspoon. In 2012, Vivian played Athena in Helen. Some of her notable roles include Sarah, the Egyptian Muslim mother in The Perfect Prayer, the 103-year old Sadie Delany in Having Our Say: The Delany Sister’s First 100 Years, and Sister Hubert, a tap-dancing nun in Nunsense. Vivian also traveled to Russia with a UAA cast of A Piece of My Heart. In 1986, Vivian performed in Lausanne, Switzerland when the Anchorage delegation vied for the 1992 Winter Olympics. She has written and performed in a one-woman show called Horse Tales, which was a 30-Something commission at Out North. She debuted as a director at Cyrano’s production of Ntozake Shange’s play, for colored girls who have considered suicide when the rainbow ain’t enuf. In 2010 at Out North, Vivian directed a premier staged reading of The Black Cockerel, by Nigerian playwright, Ademola Bello. Vivian’s choreography has been featured in Emotional Creature, Nunsense, Big River, and for 10 years, she choreographed Enchanted World, a holiday family show of robotic human dolls from all over the world. Vivian Melde, here in Anchorage, Alaska at the Organic Oasis. If ever you’re in Anchorage, you got to come to this place. So, Vivian I want you to tell us a little more about you and what you do here in Anchorage. Kind of a little bit of your background, just a couple of paragraphs worth and then we’ll jump into the five questions and you can get a lot more into your story in the five questions. Okay. All right, well I’ve been living here on and off actually since 1966. I arrived as a child. My parents moved up here from California, but originally from Guam, Marianas Islands. I work in the environmental field, I do planning and emergency management work at least for the last 16 years. Before that, I worked public affairs for an electric company here in Anchorage. So Vivian, you know how the interviews work. We ask the same five questions about hope from each person in the interview and that’s a thousand people from around the globe, so thank you for being a representative of your group of people which we will discover who that is more and more as we go along here. Question 1: What is your definition of hope? How do you think about hope or favorite quote about hope, whatever you want to say, how would you define the word hope? To me, hope is kind of holding that candle. It’s really kind of a state of being. It’s a positive way of looking at things that happen to you in your life. You know, you hear the term “keep hope alive” and I think that it’s important to do that because keeping hope alive gives you something to live for. For me, I have hoped that our world will evolve in a much better way as I see things eroding around me in other areas – in politics, in the way people are separating and it doesn’t feel that great. But still, when I work with young people and when I see positive things that happen in my life and around me, I know that there is hope that we can achieve something greater. That’s a great answer. Thank you. Great answer. All right. Question 2: Who’s been most influential in your life with hope? Who’s shared and given a lot of hope to you? I think my parents and mostly my father. A few years before my father died, he wanted to take me around in the south where he picked cotton and grew up and show me areas where either he lived or had traveled. We took this road trip, my mom, my dad and I and he started telling me stories about how he was treated at times and I remember it wasn’t very nice treatment at all. Especially young kids who were just nasty to him especially when he was picking cotton and working…his father was sharecropper, but the kids all worked, they picked cotton. I remember thinking at one point when he was telling me these stories, it’s like wow, how can you – he’s such an open and giving and happy, joyful person to have gone through what he went through. It’s like, wow, how could you not hold that against people? You make a friend everywhere you go. So, I think between him and my mom and when I moved up to Alaska, my mom started writing me letters and between the letters that she shared with me, it meant a lot for her to express the love that she had for me because it wasn’t that easy for her and I to…When I was growing up as a teenager, of course moms and daughters have their issues, but it wasn’t until I received letters from my mother where she really just poured her heart out to me. How they both held the positive energy to help me get through the tough times in my life. I think they’re the ones and they’re both gone now. My dad’s been gone for 15 years and my mom passed away in 2009. Sweet stories. Sweet stories because even the restoration – it is hard because teenagers are tough. We’re all tough on teenagers and teenagers that we have are tough, but it’s great to see that come back because some families don’t come back. Thank you. Question three is a little bit of a challenging one because it’s personal. Question 3: Tell us as time, take us back to a place, kind of paint the picture what it was like sometime in your past when you’ve really struggled with hope, where things had been really hard for any reason. What’s it been like and why was it so hard? You seem like a really hopeful person now, so it’s just been perfect for you the whole time? What’s back there? No, it hasn’t been perfect for me the whole time. I think my life challenge has been my daughter and I was a young mom. I was 17 when I had my daughter. I married her father in high school and we were together until I was 19 and when we divorced I decided to come to Alaska because I moved out of state to come to high school. So, while I was in high school, my junior year, I got pregnant, got married, had my daughter. Did you have to move because you were pregnant? You couldn’t stand the same school? No. Well actually, I was living in Southern Indiana and I went to what they call the teenage parent program. I went to TAP school in Louisville, Kentucky. You moved in because you got married? No, my father actually transferred. My family moved in 1971 and I was just starting school. I went to high school in Southern Indiana. I moved here when I was 14. I was a young mom, when I got divorced I moved back to Alaska. At that time, it was the start up of the Pipeline, so I managed to get a job. I was working. I graduated midterm my senior year, so I went straight into working. Anchorage was the place where I felt most comfortable in raising my child and I knew I had opportunities up here especially with the Pipeline starting up. I worked as a secretary for Exxon. It was a decent-paying job, I was able to afford to get a car, get an apartment and at the time, I didn’t receive much child support from my ex-husband, but the child care – at the time there was a child care program that helped you based on the sliding scale, helped you pay. Things were pretty good in the city and so I was able to make ends meet and not going to welfare or anything like that. As my daughter grew up, she started having some mental health issues including an attempted suicide at 16 years old which was very difficult. So, throughout the years we’ve gone through counseling. She’s been in and out of my life a lot. Right now, she’s out of my life but she has a daughter who is living with me. My granddaughter has lived with me for most of her life. He struggles have affected her daughter as well, but she has my husband and I. We have kind of been the stability in her life, for 15 years of her life. She’s actually doing quite well. She did make an attempt to try and live with her mother last year and it just didn’t work out. In February, I got a call from her and she was living with her mom in Montana and she says “I can’t do this anymore. I want to come back to Alaska.” So we got her up here and she’s doing really well. I’m keeping hope alive for my daughter that she will get help because I also found out that she now has a son, an infant and I am just hoping that she will get some help and make her life a more positive life for her and her baby. My biggest hope is that we get back together again and that we can have communication and be able to share our love with each other. I mean I love my daughter tremendously, but I’ve also had to let that energy go because it was draining me. I’m putting my energy into helping my granddaughter get through school and get into college. It’s not that I feel like I’ve lost hope with her. It’s affected us so much and we’ve gone through many cycles of issues with her and with counseling, you got to take care of yourself as well. So, that’s been my biggest struggle and I still hold the candle for her and hopeful that someday things will come around. Thank you for sharing that. That’s pretty personal stuff. Makes me sad for you and your daughter and makes me happy for your granddaughter that she has somebody that’s really reaching in there to help and hopeful that your daughter someday, if even… I’m sure her life and my life aren’t the same, but if like me, she can come back to some things – I’m so grateful for some of the people in my life who stayed around through some of my darkest times because they’ve given me a place to come back to, you know? We need a place to come back to. Great note there that you’re practicing well is having boundaries when there’s a hopeless situation If it’s not you that’s struggling with the big thing. A counselor of mine told me this way, he said you picture a guy in a circus or a circus performer and they’re spinning these plates, some of the clowns and jugglers. They can get 5 or 10 or how many plates they get spinning on these sticks at one time, but you can only keep so many emotional plates spinning at one time. It takes a lot of emotion to have a relationship with a granddaughter or a daughter or spouse or your next door neighbor. Each person gets a little different amount of emotion. Your mailman, mailwoman, whatever would be the general neutral term for that, they get less emotional connection than your parent or spouse. So anyway, I think you’re practicing that setting some proper boundaries and unfortunately having to ration some emotional energy because you just can’t be all things to everybody, you know? You were out and then you will be there for her maybe someday when she does come back. One of the things that I found, that I couldn’t express to her face to face because she basically disconnected from me, was to write her a letter and in the letter I just said “I picture us one day being together again as a family. I recall one time that we spent, not too many years ago, when my granddaughter was doing a soccer tournament. We were together and we were laughing and we cooked together and we had a great time. I said, I want to feel that again. I want us to enjoy each other. Life is too short. We’ve got to get past whatever the demons are and try to be a family. I couldn’t imagine going through life with that much stress on you because it felt like it was killing me.” I was having health problems because of the stress. It was affecting me. I had to take care of myself and take care of Gianni. Thank you. Thanks for sharing. I really appreciate that. I know a lot of people do because it’s so hard and for me, learning from getting to do these interviews and then Vivian here sharing with me, she’s sharing with everybody who’s listening and you’re listening right now. If you can talk about your story, even if it’s not resolved yet, it takes some weight off to share with somebody, but it also helps you process and renew that strength and energy to go back and get back to another day. Vivian, thank you for being honest enough and open enough to strengthen me and you and the rest of us listening at the same time. What are you doing just in your daily life? You’re out there, you’re doing some stuff at work, you got neighborhood, you got people you meet on a grocery store, you got a grandchild living with you, what do you do on a daily basis just to share hope with somebody else as a person of hope? I think having my dog. Having my dog in my life and my cat, but my dog especially because he is never down. He is never down. He’s a sled dog. I got him in one of the villages I was working in at the time as a little tiny pup and he’s five years old now. We live right across the street from amazing trail system and we are in the woods almost on a daily basis. I love just being outdoors, winter or summer or spring and I love exploring with my dog. I also do theater here in town and this year, I worked with seven amazing young women in a show that I directed and that was one of the most joyful experiences I’ve had in the theater working with women from, I think my youngest was 19 to about 32 years old and extremely talented women. I think the theater has always been my place of refuge in even my darkest times. I think a long time ago when I first got divorced and moved up here, one of the things that I had given up when I was married was theater and dance because I had a little baby to take care of and my husband was in college and I was trying to take college classes at the time. In counseling, the guys says “what makes you happy?” and I said “Well, dance makes me happy, theater makes me happy.” “Well then you should do it.” I’ve been doing it ever since. Why theater? What does it do? Depending on what project I’m working on, it’s always as challenge, it stimulates me intellectually. It’s a creative outlet for me. I’m more or less a retired dancer, but I still do choreography. I think it’s that creative outlet and it’s just in my bones. I have to do it. Theater, music, arts gives me a lot of joy in life. Those are both great answers. I love the dog and the theater, but I’m not a theater person. I love watching theater. We go to a lot of shows anytime we can, but you shouldn’t have me on the stage that’s for sure. I do have a dog and I love my dog. I can relate to that one definitely. That’s really great. What a great way to be connected in the community. Again, that community, those relationships are so important. Doing something you love and are passionate about in a community about things you love and are passionate about, I mean that theater part just – boy, it just gets all over. There’s just so man aspects that jumps on that help people grow and share hope. Question 5: How can I learn to share hope? My friends who are listening with me, how can we learn to grow in hope ourselves or to share it with somebody else? The simple one or two, maybe three things. Whatever you say – here’s what you got to do first, start here and get going. Think about what it felt like when someone shared it with you and reaching out to someone that you might feel needs hope. I think if you hold that energy of hope and extend it out into the atmosphere, I think ultimately if enough of us are doing that, it will lift us. Great, great steps. Back to that sharing thing again. You have to keep sharing that hope and you’re doing a great job of it. Vivian, so what’s your favorite song? What do you listen to when you’re just going down the street and need to pump that music up loud, what’s it going to be? My hit is hearing my granddaughter at about three years old singing “You are my sunshine, my only sunshine. You make me happy when skies are grey. You never know dear how much I love you. Please don’t take my sunshine away”.